Jeffrey Alpern, D.O., Cardiovascular Surgeon, Vein Treatment Specialist and the Founder/Owner of Vein Specialists of Arizona in Phoenix Provides Area Doctors an Opportunity for Free Exposure on VSA’s Website. I wanted to give something of value to Arizona physicians that would help patients, increase exposure for doctors and possibly lead to referrals of patients in need of treatment for venous disease. The Arizona physician directory seemed like a win-win. When patients arrive on VeinSpecialistsofArizona.com, they will not only get access to information about state-of-the-art vein treatment and a free vein screening exam at VSA, they also can search for other types of physicians in their local geographic area. On selected pages of the website and from prominent buttons in the website footer, patients can click a link to find family practice, internal medicine, ob-gyn, cardiology, podiatry, dermatology and even sports medicine doctors in Phoenix and nearby cities. They can search by name, keywords, specialty and/or city. And instead of the usual plain listings on most directories that only provide practice name, address and phone number, some listings will include the physician’s YouTube video, full description of services, website link and Google map to location(s). Once the physician claims their basic listing through manual verification, an automated system provides them with full access to manage their basic and enhanced free listing. And the cost for physicians to be found for keywords and display with formatted description, YouTube video and website link (enhanced functionality), is a simple link back to VSA from the physician’s website. Why would Dr. Alpern go to all this trouble and make this available to Arizona physicians at no cost? 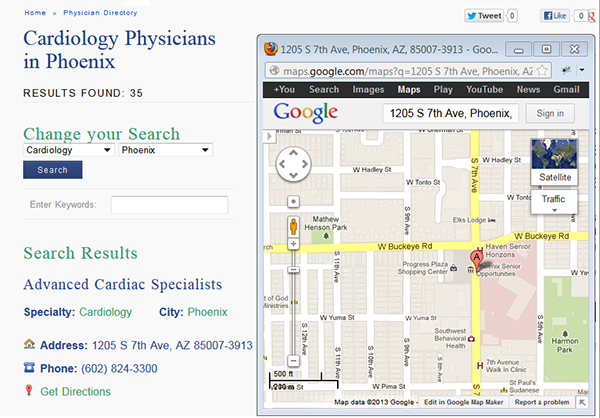 Basic listing includes practice name, address, phone and Google map to the physician’s location. Enhanced listing includes the basic PLUS website link, practice description, optional YouTube video, keywords that can be searched and produce that listing (all contents fully managed by physician’s office via secure unique login). Most likely, Arizona physicians are already listed on VSA’s website in at least one specialty and city. 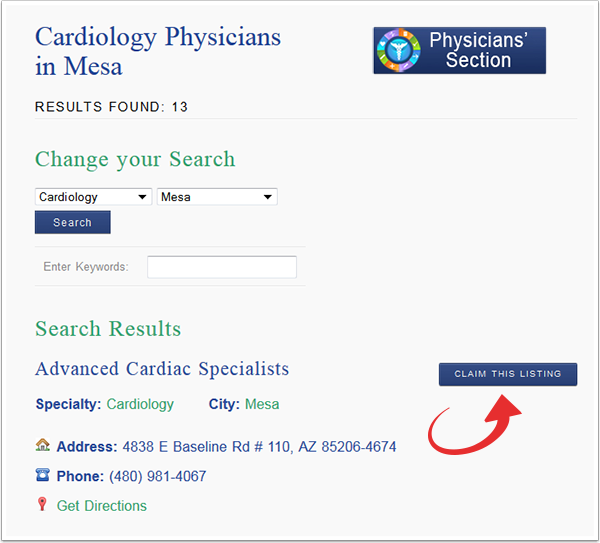 The first step is to visit the doctor section (available from Physicians’ Section button in the footer) and search. Next to each listing in the physician’s section is a button to claim that listing. Clicking that button produces a form to complete. This initiates the verification process for proving ownership and providing access to management by that physician. If they do not find their listing, they may click on an Add Your Listing button and complete a form to request a listing. Besides the directory, VSA offers Arizona doctors access to cutting edge vein treatment for their patients. Doctors and media are welcome to contact Dr. Alpern at VSA and request a tour of this brand new state-of-the-art vein treatment facility in Phoenix. According to Dr. Alpern, “During their tour, physicians and media will be introduced to our revolutionary laser ablation and radiofrequency techniques performed in a quick, simple office procedure under local anesthesia in a fully equipped operating room. Patients recover quickly and achieve a 96% success rate with virtually no complications through our techniques. We also offer patients a complimentary vein screening exam including a diagnostic ultrasound.” Patients can request an appointment by visiting VeinSpecialistsofArizona.com and signing up for VSA’s eNewsletter. Physicians and/or media can contact Dr. Alpern by calling 623-428-0068 or through the contact page of VSA’s website. Vein Specialists of Arizona is located at 9515 W. Camelback Road, Suite 108, Phoenix, AZ 85037.